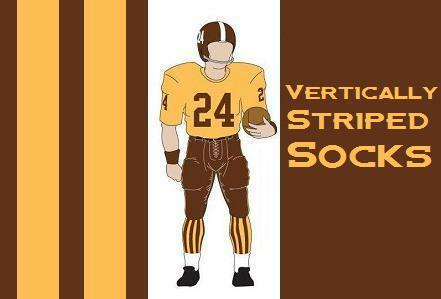 Vertically Striped Socks: Are you going to the Broncos Fan Fair? Parsley, Sage, Rosemary, and Thyme. 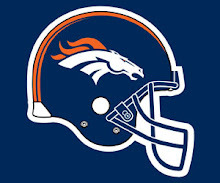 Are you going to the Broncos Fan Fair? Parsley, Sage, Rosemary, and Thyme. Who cares if it's only June, we're ready for some football!!! 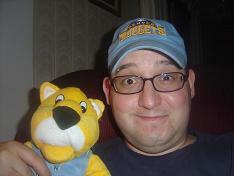 After an exciting run, the Nuggets have exited the playoffs. The Rockies are over a dozen games out of first, and there are no meaningful Broncos or Avalanche games for months. 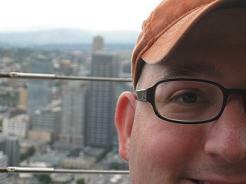 Where does the eye of the Denver sports fan wander this past weekend, you may ask? Why, to the Denver Broncos Fan Fair, of course! “What’s the Denver Broncos Fan Fair?” you may ask. Well, it’s an opportunity for people who love wearing obnoxious orange and blue clothing to do so at a time when common sense says that one shouldn’t. (I’m exempt from this rule, due to the fact that I apparently have no common sense and enjoy wearing obnoxious blue and orange clothing year round.) The Fair is held at Invesco Field at Mile High (Still one of the dumber official names for a stadium ever, but I’ve gotten used to it.) every summer, and the organization really does it up right. Bruce is posing underneath the name of his favorite Bronco of all time...Craig Morton. This year apparently all of the Broncos were there, although I the only active players I saw were Elvis Dumervil and a bunch of scrubs in the couple of hours that I was there. I also saw an old time Favorite of mine, Karl Mecklenberg. The fair is really more of an event for people who are unable to get actual Bronco tickets, so this is their opportunity to get into the stadium, get on the field (if you’re 14 years old or younger or perhaps just very short) and see what Invesco Field is really like. Plus there are vendors everywhere hawking Broncos goods, many of the concession stands are open, and there are all sorts of other crazy things to do. This is the seventh year the Broncos have done this event, but it was the first time that I ever considered attending. For the most part, I am glad I went, although I can say with some certainty that I won’t be going again any time soon. The tickets were ridiculously overpriced…it cost $20 for an adult and $10 for kids over the age of 2. They had family 5 packs for $40, but apparently you have to get them ahead of time, something that we would have liked to have known before we showed up at the box office the day of the event and were informed that what we thought would cost $40 for my Brother, his Wife, his Stepson, my Dad and my Son to attend would now cost $90. Fortunately, my portion was only $20, as my son is still under 2. My brother would have had to pay $50, but a kind person gave him a free adult ticket. Still, between all of us, we dropped $70 just to get in. Luke looked rather small next to Champ. Once we got inside, it was kind of like a Bronco nerd’s paradise. There was so much cool Broncos stuff for sale, it’s a miracle that I didn’t come home broke, but I limited myself to dropping $10 on a handmade little Broncos sign with the 1960’s logo of which I am so fond. I really wanted to get another sign which featured the brown and yellow 1960 logo, but I was able to refrain, although I did walk past the table like four times and yearned. Once I saw this, there was no way I wasn't buying it. It's glorious! Since we were trying to Malachi hooked on the Broncos crack, it was essential that he have a good time. He went down to the field, where only kids were allowed to get onto the grass, while we watched him from the seats in the lower bowl of Invesco. At least my Dad, Brother and Sister-in-Law did, Luke (my son) got a little bored sitting watching kids wait in line, so I decided to take him off to see more stuff while everyone else stayed watching Malachi wait in line. Luke sitting by D.J. William's locker, Lukers is trying to push DJ to see if he can get some playing time at linebacker this fall! This was a good decision, as Luke and I had a grand old time once it was just the two of us. There was a display set up which had a Broncos’ locker mockup set up in the hallway of Invesco, so Luke sat down in D.J. Williams locker and I took several pictures of him, while he laughed and giggled. We then went over to a bounce castle that was set up for little kids, he jumped and played on that for awhile and had fun in a way that only a toddler can have on a jump castle. It was quite fun to watch my boy having fun at an event sponsored by my favorite football team. I felt like a good father, training his boy in the way he should go. It was glorious. There is nothing better in the world if you're a kid than a jump castle. Best. Thing. Ever. After taking a bunch of photos, and bouncing on inflatable plastic for awhile, we started walking around the stadium some more. Luke was given a package of string cheese which pleased him greatly. (Small boys can be easily pleased.) Then he was given a Thomas the Tank Engine tattoo, which made him tremendously gleeful. He was definitely having a good time, and he was lugging around his Teddy Bear with a Broncos jersey on, and wearing his very own Broncos shirt, so he was looking very smooth. The moment I will probably remember best a year from now is competing on the game show, “Broncos Fan on Demand.” This is a quiz show where you place your name in a hopper and they randomly pull four people’s names to compete on the game show that will be shown on Comcast On Demand here locally in Denver. I walked up at just the right moment, and asked what I had to do to get myself on the show. They apparently were having a hard time locating one of the people who had previously been drawn from the hopper to compete, so they asked me if I would like to play. I happily agreed, and before I knew it, I was standing on the little game show stage with a microphone in my face and a buzzer in my hand. I’ve been a Broncos fan since before I can remember, and I’ve been attending games and watching them on television for twenty-five years, so one would think this competition would be right up my alley. In fact, I nailed the very first question that was asked and took the early lead, so I felt confident that I had a great chance to win. My issue wasn’t that I didn’t know the answers, I knew the correct answer for eight of the ten questions, my problem was my desire to follow the rules set out before the game began. Before the game show host named Chad came out do his best Bob Barker impression, we had a stagehand type person come out to give us a lowdown on what we needed to do. One of her instructions was to not buzz in until the host had read the entire question. My fellow contestants honored that rule for about one question. (The question which I got right.) After that, they started buzzing in very early with no negative repercussions. It took me until about question six to catch on to this, and since there were only ten questions total, I was hosed. I got the chance to answer only two other questions, inconveniently the two questions to which I didn’t know the answer. Those questions were: 1. Who do the Broncos play in this season’s home opener? (I guessed the Chargers, but it was the Browns) and 2. What is Brian Dawkins nickname? (Apparently it’s Wolverine, this was the first question where I buzzed in early, and for my cheating ways I was rewarded with a question about which I was clueless.) I tried buzzing in on all the other questions, but I think my buzzer broke halfway through, as my name was never again called. I finished tied for last place in a Denver Broncos trivia game show, but I’m going to blame it on my lackluster buzzer skills (or potentially a broken buzzer) and not the fact that I was the one who knew the least. That’s my story, and I will stick to it, thank you. Although I was a bit bummed that I didn’t win, as the first place player received an official NFL football, which would have been pretty cool. I did receive a parting gift, and I thought was pretty decent of them to not make the gift be a home version of the game, but rather a Denver Broncos 50th year T-shirt size XL. It’s kind of an ugly shirt, actually, but it was a nice gesture. Melisa enjoys some Colorado sun! Even if I was less than impressive on the game show, it was still fun. We walked around the stadium for a while longer, and at one of the booths there was an amusement company that had set up several gaming tables. There were several foosball tables set up, and Malachi wanted to foos it up. I was teamed up with Malachi, and Bruce teamed up with his wife, Melisa. The first game we played, I manned the defensive side of the ball masterfully, and even stroked home several long shots into the goal with my Goalie. Malachi and I won Game 1 of our seven game series handily, and I started getting cocky and talking trash to my fellow competitors after our 7-3 victory. In Game 2, it all started to fall apart, I let in several soft goals and we fell behind 6-1. Despite a furious comeback attempt, we were only able to get the score to 6-4 before Bruce slammed home the game winner, and just like that the series was tied at one. In the decisive Game 3, Malachi’s inexperience showed through. He played with lots of heart, but at only seven years of age our team was unable to overcome lack of his of experience in the offensive zone. We gamely fought to a 4-4 tie, but then we were unable to take advantage of the play in our side of the field, and with a few quick defensive breakdowns, before I knew it, the series was lost in a blur of three quick goals by Bruce. My trash talk after game 1 now looked like a monument of foolishness, as Malachi and I hung our heads in shame. I feel like we learned a lot as a foosball team that day, though, and I feel like next season, should we get the right breaks, we’ll be right back in the championship hunt. After all, we’ll have Malachi a year older with another year of experience under his belt, I’ll only be 33 and slightly beyond my goal keeping prime, but still at the top of my game and we’ll have a great shot to bring home the title. Yup, just wait until next year! After our loss at the foosball championships, I was pretty much an emotional wreck. I knew life would go on, but I was literally inconsolable for like six or seven seconds. When I look back on that time in my life, I’m afraid of how low I let myself get, but when you’re passionate about your craft like I am, it can get scary at times. At this point at the Broncos fair, we had eaten cheese, shopped for Broncos knick-knacks, I had won a consolation T-shirt on a game show, and my son had bounced in a jump castle. It had been a pretty full day. We considered going into the official Broncos Team Shop at the stadium, but there were so many people at the fair that there was an actual line of about thirty people waiting to get into the store. That’s right, that wasn’t a misprint, there was a line of people standing waiting to gain access to shop in the store. I’d say Denver loves their Broncos just a bit. We decided that it wasn’t worth waiting in line to shop, so we decided to call it a fair. Dad had a good time, but he was more than willing to stay in the car and sleep with Luke. We headed out to our cars, but Malachi was disappointed, because Bruce had promised that he would get him a Broncos hat. We decided to drive over to a sporting goods store that was just a stone’s throw from the stadium. Luke and my Dad were both exhausted, so when we got in the car, my son fell asleep almost immediately in his carseat, and his grandpa graciously agreed to stay in the air-conditioned car while we shopped. This store was a dud for Malachi, as most of the hats were overpriced and just not that good, but I found a treasure trove. There was a table of sports pennants that were very old and very cheap. The handwritten sign on the table said, “Five for a Dollar, or a Dollar each.” I was like a goofy sports crazed thirty-two year old kid in a pennant shop. Actually, I guess you could remove like from the previous sentence. I bought fifteen pennants for such random teams as the Portland Trail Blazers (a really cool pennant that featured covered wagons prominently), Cleveland Browns, Pittsburgh Penguins, Toronto Maple Leafs, 2 different Vancouver Canucks pennants (including a really old one that featured their ugly red and yellow skate logo from the eighties and early nineties), a Cincinnati Bengals, and several others which I cannot remember off the top of my head. I really like pennants, and the whole lot of fifteen cost me a whopping $3.23 after sales tax. I was quite pleased with my purchase. 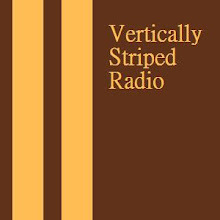 After the store, it was officially time to end our little fan fair excursion, I had to take my Dad back to his house, and then get home in time to do the Vertically Striped Radio show. It was a fun day, even if I have to say the Broncos Fan Fair was tremendously overpriced, I had a good time. It’s not something I plan to ever to again, but a good time was had by all, which is really all you can ask for with these things. Go Broncos! !